Summer times means green lawns and spending time outside with family and friends. You want to make sure your entertainment space is gorgeous and vibrantly green. These awesome tips can help keep your grass green and beautiful all season long, making it the perfect backdrop. Most lawns need 1-1.5” of water a week, from rainfall or sprinklers. It’s best to give your lawn more water, less frequently, to encourage roots to grow deeper. Timing depends on climate and soil type. Make sure sprinklers are delivering water to every area of the lawn, equally. Most sprinkler heads can be adjusted using a small screwdriver. Keep the blades on your mower sharp, dull blades will “tear” the grass instead of cutting it cleanly and allow water to leave the grass blades more quickly. Give your lawn a boost in the spring, once soil temps reach 55°F. Feed about 4 weeks later, and then every 6-8 weeks during the growing season. A slow release granular fertilizer will help avoid burning the lawn. Only cut the top 1/3 of the grass off at each mowing. 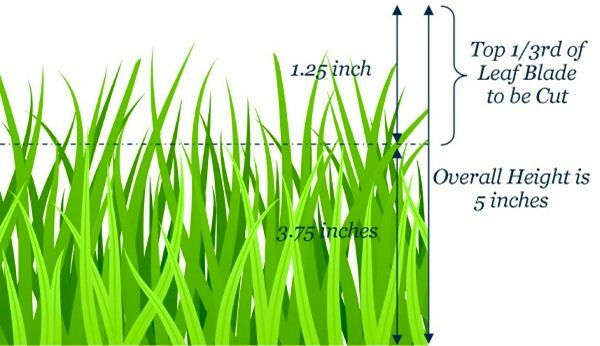 Taller grass creates more shade, holding more moisture in the soil. Taller grass also encourages a deeper root system.